The history of food trucks runs deep—from the “Chuck wagon” invented in 1866, to Oscar Mayer’s first Weiner Mobile in 1936, to today, a more sophisticated menu at such trucks like Kogi BBQ. The history of food trucks runs deep—from the “Chuck wagon” invented in 1866, to Oscar Mayer’s first Weiner Mobile in 1936, to today, a more sophisticated menu at such trucks like Kogi BBQ. So what shift changed the way we look at and appreciate food trucks? When Kogi BBQ arrived with its Asian inspired tacos in 2008, in many ways, it was an appropriate time because consumer confidence was shaky and the diners wearied of giant chains, yet they still had high demands for flavorful affordable, quick meals. The combination of all these factors on top of a social media explosion created the spread of food truck popularity and a shift in the usual customer base. True to form of fine dining chefs turning entrepreneur in a food truck, the hit 2014 film, Chef, tells this story of a professional chef who quits his demanding job at a trendy Los Angeles restaurant and decides to travel cross-country cooking out of his food truck. It’s a story about rediscovery and reconnection, with both food and people that resonates well today. Food trucks have succeeded on so many levels—appealing to a nostalgic notion of eating with their hole-in-the-wall feel, and building the buy-in of today’s access-obsessed customers by using social media to “cultivate the crucial element of community.” They also reflect the nation’s changing population, capitalizing on its growing diversity: As of April 2014, 11 percent of food truck menu items were considered mixed ethnicity. The need for adaptability in food trucks, in addition to low start-up and operating costs, has empowered chefs to be bold and adventurous in their menu decisions. Authentic flavors and approaches are being paired in unique and surprising ways. The Smithsonian article sums it up well: “Food trucks are the new incubators of culinary innovation.” Not only are they incubators of culinary innovation, they are a tried-and-true testing ground for chefs to “test drive” their culinary concepts with low overhead before jumping into the full brick-and-mortar investment. But lest we think that it’s completely out with the old and in with the new, it’s apparent that what is happening in food trucks is making its way back to the brick-and-mortar establishments we all know and love. Food trucks have helped provide the entire food industry with culinary focus at a time when many had lost sight of consumer needs and interests, taking what’s being learned on the road back into restaurants. As one LA food truck owner put it, “The food truck is an engine for validation.” Here in Miami, The Latin House Grill moved its successful food truck operation to two highly successful brick-and-mortar locations. They’ve won multiple awards and have been featured on the Food Network; their dishes offer unique ethnic blends with Latin favorites like plantains, guava sauce and chorizo. Who is pushing innovation of the food truck phenomenon? Last September, as part of a new multi-format prototype, Johnny Rockets announced an innovative way to reach consumers—and guess what—did it food truck style! Johnny Rockets is working on pop-up theater catering services with the help of USA Drive-Ins. Together they plan to cater to families and community events with a Johnny Rockets food truck (dinner-and-a-movie) catering option. In the Miami area, a non-profit organization Empowered Youth USA program has taken the food truck concept to another level with Vibe 305. Serving a comfort seafood menu like conch fritters and shrimp burgers, this is no ordinary crew, staffed by at-risk young men with emphasis on rehabilitation by job skill and character development as well as entrepreneurship. 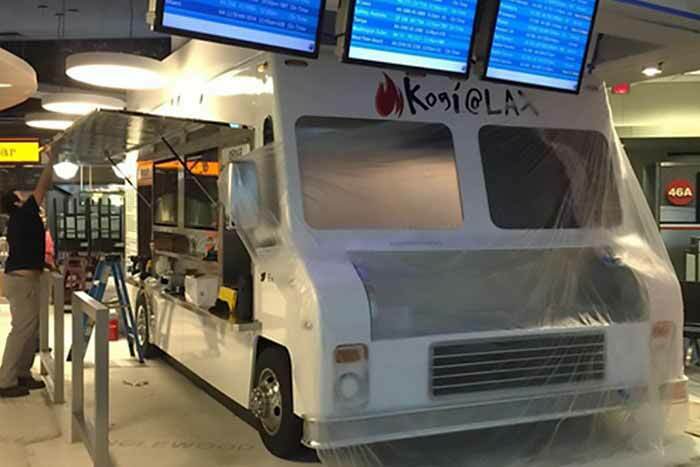 And to top off the innovators, we go back to where we started, the original Kogi BBQ has expanded and taken their still popular concept into the airport. Check out their truck in LAX Terminal A. Regardless of where the trends go from here, the food truck has made a lasting mark in its long legacy.